With quarterback Philip Rivers getting the day off, the Los Angeles Chargers offense was held scoreless in a 13-7 loss to the New Orleans Saints in a preseason game at StubHub Center Sunday. 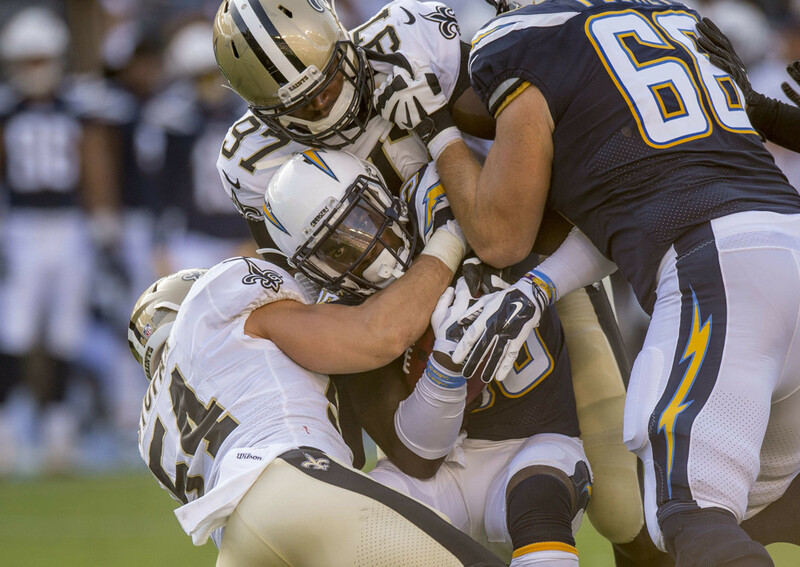 The Chargers allowed eight sacks and were held to 66 rushing yards on 29 carries, an average of 2.3 yards per carry. Their defense allowed rookie running back Alvin Kamara to run 50 yards for a touchdown on the Saints first play. “That’s a preseason game, but that couldn’t have gone any uglier in my opinion,” Chargers coach Anthony Lynn said. “I thought our defense played well other than the first play of the game, which could have been made a difference because of the turnover they scored on later. Rivers did not play because he practiced against the Saints in shoulder pads Thursday and Friday, Lynn said. The Chargers expected regular-season starters on offense and defense will play a half of Saturday’s preseason game against the Los Angeles Rams, Lynn said. Kellen Clemens started at quarterback and played the entire first half, when the Chargers went scoreless on seven possessions, punting five times, turning the ball over on downs once and having the ball when the half ended. The Chargers deepest first-half penetration was to New Orleans’ 36-yard- line one minute, 46 seconds before halftime when Andre Williams was tackled for a one-yard loss on fourth-and-one. Clemens completed 10 of 17 passes for 99 yards and was sacked four times, a week after he had two passes intercepted and lost a fumble, which the Seattle Seahawks converted into 17 points in a 48-17 victory. Cardale Jones quarterbacked the Chargers in the second half. Their offense’s best scoring opportunity ended with 7:34 left in the third quarter when Jamaal Jones fumbled a short pass at the Saints 10-yard line and the ball was recovered by Manti Te’o, who played for the Chargers from 2013-16. Jones completed seven of 15 passes for 61 yards, had his last pass intercepted and was sacked four times. The Chargers offense has failed to score on 18 consecutive possessions dating back to the preseason opener and failed to score a touchdown on 22 consecutive possessions. The Chargers avoided their first shutout in a completed preseason game since 1975 when safety Dexter McCoil intercepted a pass by Ryan Nassib and returned it 99 yards for a touchdown with 8:52 left. Linebacker Nick Dzubnar took “complete responsibility” for Kamara’s touchdown “because that run hit my gap,” he said. The Chargers (0-2) were outgained 265 yards to 158, trailed 15-13 in first downs but led 32:10-27:50 in time of possession. The game was expected to be a matchup of the quarterbacks who started all but one regular-season and postseason game for the Chargers since 2004, Drew Brees and Rivers. Brees also did not play. He also did not play when New Orleans opened preseason play with a 24-20 loss to the Cleveland Browns Aug. 10. Chase Daniel started at quarterback for the Saints for the second consecutive week, played the entire first half, completing seven of 12 passes for 63 yards and was sacked twice. Nassib, who completed six of 15 passes for 55 yards and one touchdown, was sacked once and threw one interception. Will Lutz kicked a 53-yard field goal on the Saints second possession a 26-yard field goal with 2:11 to play. The announced attendance of 21,197 at the 27,000-seat StubHub Center was 143 more than the announced attendance of 21,054 for the Chargers preseason opener a week earlier. Attendance at NFL preseason games is typically lower than the regular season. The Chargers are sold out of season tickets and have a waiting list. A limited number of premium seats remain available.